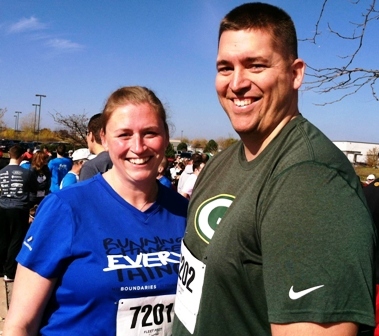 I'm Matt Reller and I became a runner for my children. For much of my life, I was comfortably sedentary. In February of 2012, my world was shaken and that all changed. My wife, Amanda, and I had a stillborn son, named Frank. In the midst of our grief, we took stock of our health. I was 360 pounds. She told me that we had to do everything we could to have as much time as we could with each other. She had been a participant in the No Boundaries program before, and she wanted to do it again, but not alone. She wanted me to do it with her, and with that logic, I could not say no. I joined that spring session with full intentions to go through the motions to pacify her request. In the midst of my anger and grief, my competitive spirit got the better of me. Along the way I began to really enjoy the way I felt after running. I wanted more and it became something I missed when I didn't have it. Early and often, my thoughts would turn to Frank and the things I didn't get to teach him. Little did I know that he was teaching me how to be a better version of myself. Through all of 2012, I participated in the No Boundaries sessions that were offered. I became a regular customer at Fleet Feet Sports Madison, and liked the people there. The more I ran, the more weight I dropped. I now weigh in at 298 pounds, and am excited my weight starts with a two. In early 2013 I was in need of a part-time job, and during my search I saw a Facebook post that Fleet Feet Sports Madison was in need of night and weekend part-time help. Luckily, I was able to join the staff and it feels like where I belong. We also found out we were pregnant again, this time with a little girl we named Ruth. I would not have made it to where I am now without Frank, Ruth, and my wife. Their persistence and persuasion pushed me into a whole new world. One that is both challenging and rewarding. Rewarding enough for me to now be a full-time employee. I have been working at Fleet Feet Sports Madison for one year and each day I still get nervous and excited to go to work. I get to help people meet the goals that they have set out to accomplish. I have now mentored in the No Boundaries program twice and it gives me that same feeling of helping people see what they can achieve. I feel blessed being able to share with people the No Boundaries program and the store that gave me so much at a time in my life where I felt so raw. The staff and the participants in No Boundaries have become an extended family that I am proud to belong to, and one that I am happy to introduce to as many people as I can.